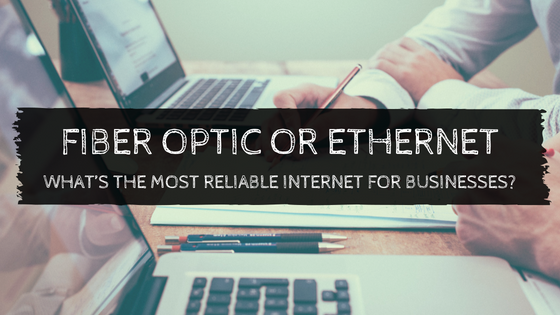 Fiber Optic or Ethernet: What’s the Most Reliable Internet for Businesses? In a world where e-commerce generates $1.2 million every 30 seconds, businesses cannot afford to have slow, unreliable internet. Regardless of your industry, the digital world is where the majority of our business exists. Between emails, virtual meetings, information gathering, and advertising, companies are spending their professional lives online. Shouldn’t your internet be up to par? To settle a long-standing debate on how to obtain the most reliable internet, we’re diving into fiber optic and ethernet to determine what’s best for your business. In order to determine what’s really the most reliable internet for businesses, we need to define ethernet and fiber optics and delve into their pros and cons. Ethernet has been the most common form of internet service for decades. Developed by, believe it or not, Xerox, it became the main commercial choice in 1980. Due to the time of it’s innovation, ethernet relies on copper cables to transmit data. Copper cabling, in turn, means, that ethernet service is quite slow. Despite the decades that have passed, ethernet is still considered quite slow. Today, the fastest speeds you can find is 100Mbps and in some cases “Gigabit Ethernet” has the capability of 1000Mbps delivery speeds. Another drawback is the electric signals that transmit data. By transmitting data with electricity, ethernet is susceptible to electromagnetic interference. This becomes a predominant security concern among businesses with ethernet service. Fiber optic cables may seem like a new innovation, but their beginning actually dates back 100 years. That’s right! The idea of fiber optic cables was considered by NASA, to broadcast the moon landing in 1969. Fiber optics have come a long way since 1969 and today, they can be found in our homes and in the workplace. Instead of using electricity to transfer data, fiber optic cables use light. This means faster speeds and greater opportunities. The cables are made up of hundreds of hair-thin strands of pure glass. Don’t let the glass fool you! These cables are among the most durable on the market. Fiber optic cables come in single-mode and multi-mode. Single-mode fiber optic cables use laser light to send signals, while multi-mode cables use light emitting diodes (LED) to send signals. We mentioned that they’re fast, too! The standard cable can transfer data anywhere between 10Mbps and 10Gbps. However, a single strand of fiber optic cable is proven to have the ability to carry data at an incredible 100 terabits per second (Tbps). Fiber optic cables are also more secure than Ethernet cables. By eliminating the electrical impulses, fiber optics are not as vulnerable. The most reliable internet type is fiber optic cables. Fiber optic cables are, without a doubt, the fastest choice. More than their speeds, they’re also the most reliable. Imagine not having to worry about delays. Imagine being able to rest easy knowing that your information is safe and secure. With fiber optics it’s not part of your imagination, it’s reality! Fiber optic cables are the solution for businesses that are ready to take their digital presence to the next level. Between lightspeed connection, security, and delay-free service, it’s no wonder that modern offices are ditching copper cables and replacing them with the connection solution of the future. Looking for Fiber Optic Solutions for Your Business? CableLAN Products has been providing reliable internet solutions for businesses in the Boston area and beyond. Don’t suffer from the unstable internet that’s costing you clients. Give us a call at 508-384-7811 to discuss how our fiber optic solutions can take you from sloth speeds to fast transmissions. By admin|2018-06-26T12:59:30-04:00June 26th, 2018|Blog, Fiber Optic Cables|Comments Off on Fiber Optic or Ethernet: What’s the Most Reliable Internet for Businesses?